First off, eBay has finally made it nearly impossible to grab pics from auctions, so I will be discontinuing posting about eBay pick ups. Its probably for the best. In any case, my “pick ups” have gotten boring – tires, helmets, chains, &c. Happily this is due to the fact that I have been spending more time riding. 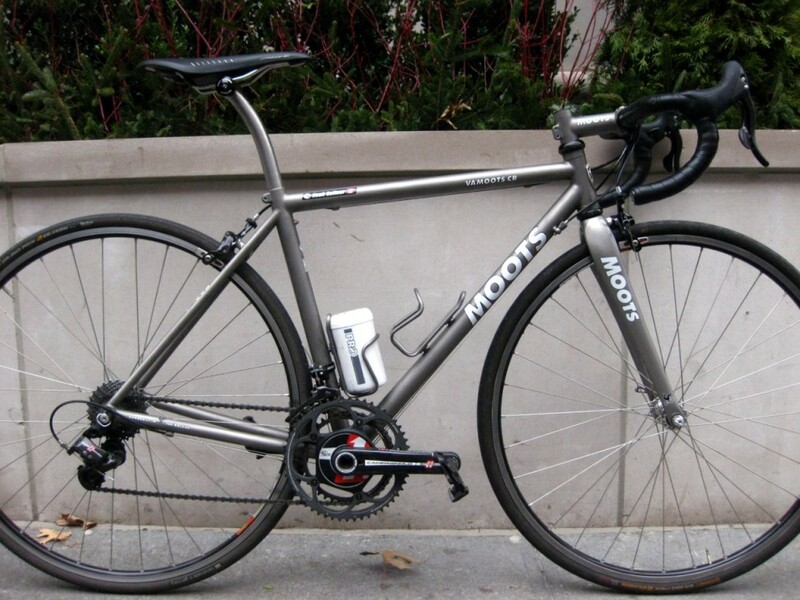 This Moots Vamoots CR is my main ride, though I do try to mix it up. It is a 50cm, so it has a 52.5cm top tube, measured center to center along an imaginary horizontal plane. When I first got the bike, I had just come from a 50cm Cannondale CAAD10 and before that a 52cm Moots Vamoots. Moving from bike to bike I tried to maintain some consistency in my position but came to two conclusions – first, my position was ripe for improvement and second, migrating position is ripe with hidden challenges. Improvements to my position came from rectifying mismeasurements and reflecting improvements in my fitness and flexibility. Consequently, my saddle height went up and back and my stem when down. Where I had been running the saddle at 700mm, measured from the center of the bb spindle to the top of the saddle at the center of the rails, I have now moved up to around 715mm – a huge increase. The saddle also went back from 45mm to 55mm measured from the horizontal distance that the nose of the saddle sits behind the center of the bottom bracket spindle. I dropped the stem 10mm too. Moving the saddle back on the Moots seatpost looked awkward because the Fizik Arione was “slammed” – at the end of the rails. I did a little research and found that seatpost makers were coalescing around a standard setback of 20mm – at least that what was offered by Moots, Easton and Campy. Happily Kent Eriksen – the founder of Moots – would make a seatpost with up to 30mm of setback (although without warranty). That is what I got, and am happy for it. I am still tweaking the saddle height, moving it up and down at 2mm increments, trying to find the spot that is just so. The challenge is trying to be precise in measuring the height. My Campagnolo crankset doesn’t have a centerpoint that is easy to pinpoint – just a big hole. The saddle curves, making it a little tricky to identify the “top”. Finally, picking the “center” of the rails is a bit inexact. I have been looking for a tool to simplify the process. There is a bike fit tool, but I don’t love it. In my mind, the perfect tool would be a steel or aluminum meter stick with point that extended at the O mark and a sliding T with a level. Maybe I’ll make it. I read that the optimum saddle height is determined by finding the spot just below where you lose control at the bottom of your pedal stroke. This is best determined by riding at some force but with reasonably high cadence on a trainer and having someone watch your knee action. When the saddle is too high, there will be an acceleration at that point and maybe some knee wobbling – the feel of a saddle that is too high.